"In autumn 1965 LSD was still legal in both the US and the UK. 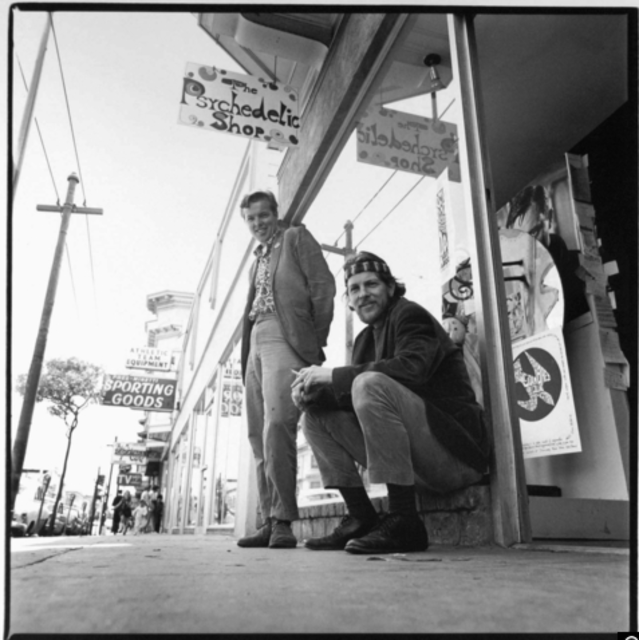 Jay and Ron Thelin outside The Psychedelic Shop, c. 1966. "San Francisco quickly gained a cohesive psychedelic identity. In January, the Thelin brothers opened up the Psychedelic Shop on Haight Street, which stocked everything an acid head might find interesting or neces­sary. Later that month, the Pranksters combined with local activist Stewart Brand to hold the Trips Festival: 6,000 people attended over three nights. "This was not strictly true. ... [But] the real message came a few lines further down in the Life story: 'Now the federal Food and Drug Administration is moving in with new laws which will outlaw LSD's illegal manufacture, sale or transportation.'"